The CFA accepts the Scottish Fold cat in any and all genetically possible colors. The exception to this would be of those showing evidence of hybridization. These colors are chocolate, lavender, the Himalayan pattern, or a combination of these and white. 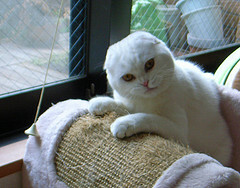 The Scottish Fold comes in both long and shorthair varieties. Neither requires extensive grooming. The longhair just needs combing and an occasional bath. The Shorthair is even easier, in that the bathing is best left to the cat itself. Regular petting and brushing will keep the shorthair looking its best. Whenever grooming these cats, please be gentle, as they are sensitive. The Scottish Fold is an undemanding cat. A clean environment, proper nutrition, and generous doses of love are its only requirements. Scottish Folds adapt to almost any home situation and are as at ease in a house full of family and other pets as they are in a single person’s condo. Calm and not easily alarmed, they travel well, and they adjust to other animals extremely well too. Scottish Folds can be either folded ear or straight (normal) ear. The folded ear is produced by an incomplete dominant gene and is the result of a spontaneous mutation. While the folded ear is the only one allowed for show (so far) this cat is a wonderful addition to any home regardless of ear conformation. Just like their barnyard ancestors, Scottish Folds are healthy, sturdy cats Their loving and friendly demeanor echoes their sweet expression. They have low, delicate voices and are considered to be vocal. They enjoy human companionship and give back as much love as they receive. This breed of cat is very calm, sweet and playful, and not at all demanding, so it will adapt to almost any situation it is put into. 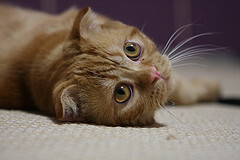 Scottish Folds lead long, healthy lives, often up to and past the age of 19 years. Clean, quiet and beautiful, these cats are happiest in any situation where they receive lots of love and can follow their human around to keep them company.